We hope to soon have a diverse collection of articles, videos, audio files, and other resources available online. Until then, here is a sampling of local history education goodness. Currently, the Museum's Research Library is open by appointment only, please call 479-621-1154 or email museum@rogersar.gov for staff availability and to set up an appointment. It consists of magazines and newspaper articles, books, research manuscripts, maps and photocopies of historical documents and local directories, as well as Museum-generated research reports and oral histories. Objects in this collection are frequently used for public and staff research. Also includes modern prints, slides, and negatives that can be, with permission, used for programs, publicity, research and exhibits. 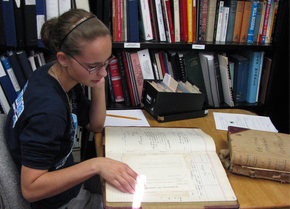 Explore historical topics of interest in the Museum's Research Library.